Discussion in 'Backpacking' started by CaliforniaCanuck, Apr 26, 2016. OK, before we begin, this is BACKPACKING topic, not car camping, not ATV camping, not a day hike, etc.! My meaning is - you are carrying all your worldly possessions, that matter, on your back. This technology is always changing so I'm wondering what you guys have found out there that works well for backpacking? Beach Hiker, ra2bach and Bobsdock like this. Beach Hiker and Loogaroo like this. Fenix with a head band. Beach Hiker and Glock Holiday like this. It's a small single AA sized light with a clip to attach to the bill of your cap, hang from a tent roof or work as a tac light if needed. Very lightweight yet tough as nails. I back it up with a photon microlight. Beach Hiker and Kreger like this. foresterfrench, Royal Wulff, Beach Hiker and 1 other person like this. In Winter; Led lenser H5 head lamp and a UCO micro lantern. In summer; no need for artificial light. Black Diamond Gizmo headlamp. 2.5 oz. Hi/lo/blink/off. Photon. .5oz On/off, squeeze switch. First I love lights and have too many, now that that is out of the way what I currently carry varies by the trip. Usually I carry a Petzel Zipka because it's 100 lumen and very compact and a UCO Clarus for a lantern and flashlight that's 150 lumen on high. The clarus is about 4 ounces with batts but so is my R-Pal area light which lacks the flashlight function but is 300 lumen with 15 brightness levels and it really throws the light around camp. I do like my UCO candle lantern for when I'm not making fires but a new Lucie light will take it's place due to weight. At times I carry a 850 lumen Fenix just because. This light, the Ra by Zyntony, seems pretty cool for so many uses from my mountain bike to hiking to work. That Zyntony Ra light looks neat but one kit is $79. I'm searching for a new flashlight and $25 seems to get a lot flashlight. I'll probly buy the mag lite XL50. As much as I don't like headlamps, I find they are what you want for backpacking. All too often I find myself trying to set up camp and cook at dusk and into evening, and for that you want to be hands-free. You can get a quality headlamp with various illumination modes for under $50. Just choose a quality brand that uses AAA or AA batteries and you'll be all set. ra2bach and backlasher like this. LED headlamp that used AAA batteries. That or a Luci solar lantern (for the summer time). Petzl Tikka with rechargeable battery. If I'm out for a,long time I also take along my 4 Oz Sunlinq solar panel. I had a Princeton Tec Quad, which I loved the features of it, but the plastic case cracked and broke even though I was very careful with it. I replaced it with an aluminum body Fenix headlamp HL25. It's 3.18 ounces, according to the website, and runs off 1 AA battery. I really like it, except for 1 gripe that is true of almost every headlamp I've used. When you turn them on, they all start on full-blast high setting! I wish they would start on the lowest setting, and then get progressively brighter so that you have a chance to somewhat preserve your night vision and aren't blinded when you turn them on. When backpacking, I hike all day and sleep at night. I only need light to help me cook, take a leak, or read. In other words, I only need to see well at arms length, or the ground right in front of me as I walk, I don't need to light up the whole mountainside. Since those are my requirements, and I shave weight wherever possible, I carry and use the Petzle e+LITE. It weighs less than an ounce, is hands free, puts off more light than I need, and I haven't had to change batteries in years. Very curious to see what's mentioned in this thread. I currently don't really have any artificial light for the woods. I've been interested in a headlamp just because it's hands free. My struggle has been finding one. It seems there isn't really one stand out/go to light. I'm always hoping to see an overwhelmingly popular model so I don't have to go through a dozen to find a good one. I practically live using headlamps and flashlights out of my backpack. Here are 3 videos I did showing 4 good options and better yet in actual backpacking settings. Fenix HL50 vs Armytek Tiara A1 Pro. Both use 1XAA and are winners though have a slight edge to the Fenix HL50. A short video of my trail lights for warmer weather outings on the AT. It includes the Fenix HL30 which is inexpensive which runs of 2XAA. My review of the ArmyteK Prime Pro A2 & C1 plus A1 Prime. These are flashlights which use 2XAA, 1XCR123 or 1XAA and lithium ion, the pros can run unprotected lithium ion safely. Like all the other done from my backpack in the woods. my eyes are pretty good, so I look for one I can turn down real low as to not fry my night vision/ blind others camping with me. These work well, are light, small, and fit my needs and comforts. bear in mind that I see quite well at night and really don't want a lot of light most of the time. I've also got 4 kids so my stuff tends to be on the budget-minded end of things. I use a coast HP-5, I think it is, that's been a good light for twenty bucks but the one flashlight that I find I use most of the time are these little aluminum keychain AAA ray-o-vac lights that I get for four bucks at W-mart. I keep one around my neck and use that for 90% of everything that I do around camp. I've got a little lantern-ish plastic cap that spreads the light if I need. my main reasons for raving about these things is that they are absolutely water-proof, tough as nails, and the little AAA batteries last a looooooooong time. I prefer to only use lights that I can easily get batteries for anywhere. the cons, they're not terribly bright...that being said I consider that a positive ( for me) because I HATE to mess up my night vision. not the be-all end-all, but for the price you might try one.... I've probably had half a dozen of 'em, daily hard and wet use, over four yers and have had zero trouble with any of them. My headlamp is the zipka with option for the red LED. The red light saves your night vision and is bright enough to light up your workspace or tent. I've owned several of these and I like the compactness of the cable instead of a strap. Also, if you hang to light around a water bottle with the light facing in, it turns the bottle into a lantern. I keep two going, one in the car and another for trips. You might want to check out the NiteIze headlamp from Lowes, they have a 142 lumen model that's been discounted to $19.99 at our local stores here in the Carolina's. I love mine, it's very adjustable and has a red light mode that helps you retain your night vision when taking a leak at night and it's great for not disturbing others when you're in a group. The 2016 Black Diamond Spot is what I use and recommend. I also keep a Photon clipped to one of the zipper pulls on my pack. X5! on the UV Paq Lite! I love those things and bought a ton of them! Backpacking always makes weight a concern, however, I’ve found the hands-free headlamp to be essential, especially when you try and squeeze a few more miles out as the sun is going down or you want to break camp and hit the mountain top as the sun rises. I think the ubiquitous Photon is such a simple, small and light LED that it could be added to anybody’s kit and go unnoticed until needed. I predominately prefer single cell lights. I’ve just found they allow me to judge the amount of light left much easier and I can carry a spare battery with no penalty, but provides better predictability. Despite the preference for a single cell, my favorite lightweight headlamp is Petzl’s e-LITE. Some great features on the smallest of headlamps and I can carry two spare CR2032 batteries in my ID card pouch. If you ever expect to hike past sundown or break camp before sunrise to hit the trail, I’ve used a Zebra and more recently appreciating the Fenix HL50 (1.8 ounces without battery). The Fenix is awesome and I hike out during the darkest hour as a bad storm was brewing and I wanted to get out before the creeks rose to high…it was already raining, but the headlamp was simply perfect for the two hour hike out. Out of habit, I often pack a single cell LED pocket light. I’ve been using Sunwayman for years (they take variations of AA or CR123 cells). I’m trying an even smaller Olight S1 Baton light, although it only takes a CR123 battery. Some may not see the need, but that is highly dependent on the activities. Our distance backpacking always has us up before sunrise and some unfortunate late hikes past sundown. Hands-free lighting is very important for our needs. SC864 and Not Sure like this. For ultralight you may want to consider APALS. Those are LEDs, run up to 80 hours. Waterproof. 3 modes. Pack of 10 costs 30-40. Variety of colors. Look up some youtube review videos. Wrap a stick in rags then soak the rags in tar and kerosine. Light with a match, and you're good to go! I've seen this work in almost too many movies to count. Even Bear Grylls uses this method when he's exploring caves that he has no reasonable expectation of ever escaping alive. It has served mankind for centuries. Gruxxx and Foulwind like this. That would work well in the tent! I wish I could find the post but I was looking through this thread last week and saw someone that was unhappy that his light starts at the brightest setting and must be transitioned to a dimmer setting - I don't know the exact model but my headlamp is a Princeton one and it starts out at the dimmest red setting, then moves towards the brightest white setting. I just bought a Black Diamond Spot Headlamp. I don't really like the cool blue tint and it doesn't memorize your last mode, but other than that the features re pretty great. You could hold the button down and focus the brightness rather than cycle through set modes, it has a throw beam, a fantastic flood beam, and a red LED for preserving night vision. It is really light wait and has the power tap feature so you could tap the side and get full power then tap again and return to previous setting. I am a enough a a flashlight nerd to checkout Candle Power Forums every now and then, and it doesn't seem to get rave reviews over there with the flashlight gurus, but its marketed as a backpacking light and it gets great reviews among backpackers. For handhelds, I have a Fenix ld20 that is MIA and I considered replacing it with an ld22. Two aa might be a bit big and heavy if you like to go really light, but the ld20 sold me on Fenix products and I would like another one sometime. I bought a thrunite T10 last year and planned on using it for any backpacking trips I might go on as well as edc, but it broke in like a month. They offered to replace it but they wanted me to send them pictures of the package and shipping confirmation and I never got around to it. The Neutral tint would have been great though. I just have a Small button battery Photon (green light) on my EDC PSK necklace and a small 2 cell AA Maglight in my pack or day bag. whatever you get, make sure it has some kind of waterproof rating. I got a Coast HL7 based on it's excellent beam but is only water "resistant". I only use it around the house now. I replaced it with the black diamond Spot that is rated to Ipx8. I always want to double up on important items, especially if it's prone to failure like electronic lighting. If I'm backpacking, where weight is a priority, I back this up with a Photon light. If I'm camping or hunting, I'll add a handheld light that uses the same AAA batteries. The headlamp of your preference is probably better than a handheld light. My preferred headlamp is the black Diamond storm. It has lots of brightness levels, red LED mode, is waterproof (dropped it in a lake once. No issues), has a battery indicator, and takes AAA batteries. I have the 2015 version, which has a max of 150 lumens. I feel that is plenty bright for the woods. The newer version is brighter, though. does the Storm use 4 AAA batts?.. For backpacking I only use a headlamp that uses two AA batteries, not AAA, and definitely not three AAA. That said I use a Fenix HL30. It's a very solid dependable light. No love for the Streamlights? I've got a Streamlight 14512 Sidewinder Compact II Military Model Angle Head Flashlight, Headstrap and Helmet Mount Kit (http://smile.amazon.com/Streamlight...-1&keywords=streamlight+sidewinder+compact+ii) and love it. Three levels of brightness plus strobe. White, red, blue, and IR. On/Off switch and color selector are separate. Takes CR123, AA Alkaline, or AA Lithium. Detaches from headstrap. Can then be clipped to hat, packstrap, etc. Originally had a Compact I model but didn't have the headstrap. Wife then bought me the Compact II kit. Only one real differences besides some style changes. 1. The model II uses CR123 or AA, model I is CR123 only. Wouldn't give up either of them for any flashlights I've found so far. 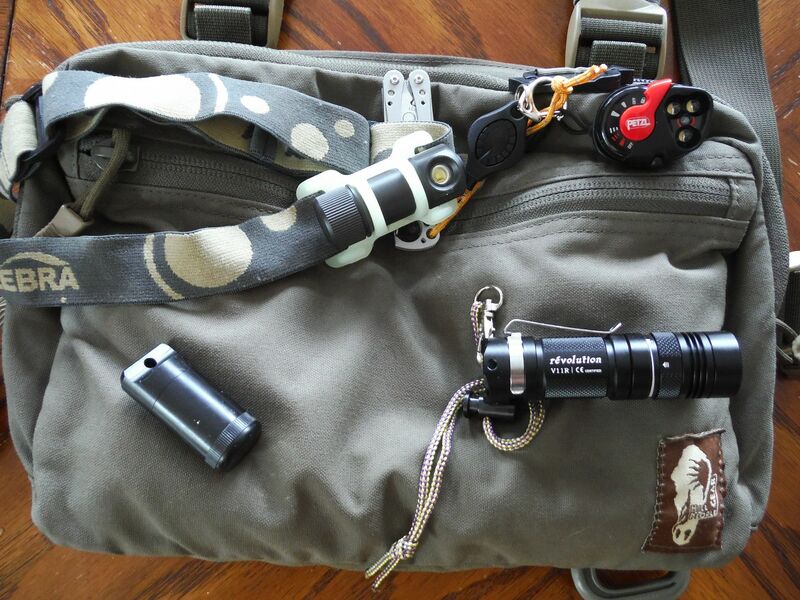 Great all around flashlights. I've got some old Maglights I've converted to LED that I keep for really reaching out to see what is going bump in the night out in the yard/woods. I've got a Surefire 6PX Defender Single Output LED Flashlight (older version that has checkering rather than the finger grooves) that I keep attached to the firearm for things that might go bump in the night in the house. I've got a few different lanterns for general illumination. Also, quite a few different lights I've picked up over the years. But, those two Streamlights are my go to flashlights for general use and EDC and when camping. Gii shi kan dug likes this.